I am a geologist, tectonicist, and earthquake scientist. My interdisciplinary, collaborative, international research focuses on quantifying natural Earth processes that yield insight into plate tectonic systems. I study the crustal deformation of continents, collecting data that allow me to reconstruct past tectonic movements over a large range of temporal and spatial scales, from individual earthquakes to millions of years of plate motion. 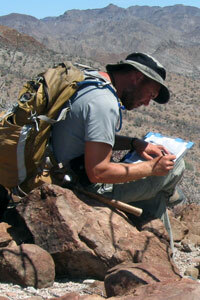 I combine observations and measurements from field-­‐based geologic mapping with those from remote sensing datasets. I integrate these findings with precision analytical laboratory techniques, such as isotopic dating and paleomagnetism, to quantify and visualize rates of geologic processes such as tectonic plate motion, fault slip, and the formation of large seaways such as the Gulf of California.